One of the best things about winter’s arrival is the chance to enjoy skiing and snowboarding. 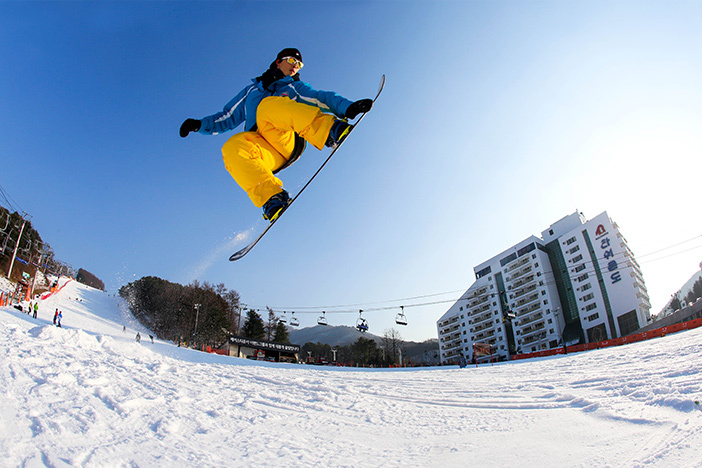 Ski resorts in Korea offer slopes for a variety of skill levels, from absolute beginners to experts. The resorts also come equipped with modern facilities for visitors’ convenience. 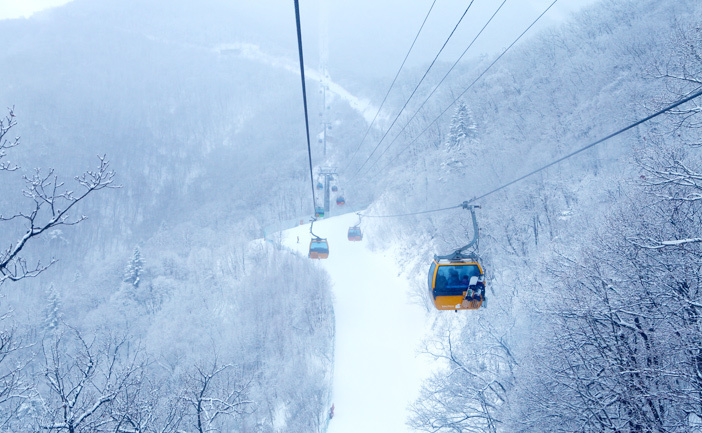 Most people visit ski resorts in Gangwon-do, the region that receives the most annual snowfall, or in the outskirts of Seoul. Most resorts are large, leisure-focused facilities that stay open all year round and are nestled in beautiful natural surroundings. Common amenities include sledding for children, gondolas and walking trails to take in the winter scenery, and spas to relax the body. As all ski resorts differ in prices and operating periods, it is strongly recommended to check for details before visiting. During the peak ski season, from mid-December to the end of February, visitors are recommended to reserve hotels, motels, or pensions (inns) ahead of time. Phoenix Snow Park is known for its many valley-style slopes and high-quality snow. The resort features ski courses for beginner, intermediate, and expert skiers, as well as a snowboard park, complete with a half pipe, table top, round quarter, and rails. Moreover, Phoenix Park has hosted various competitions, such as the parallel giant slalom and slopestyle, for the PyeongChang 2018 Winter Olympic Games. ☞ Nearby attractions: Herbnara Farm, Lee Hyo-seok Culture Village, etc. 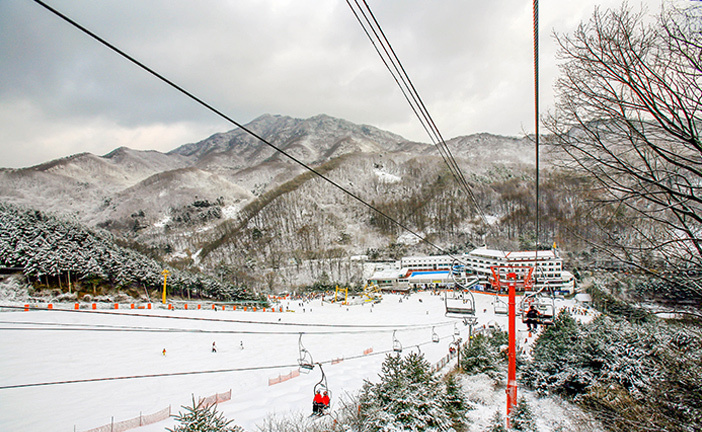 Yongpyong Ski Resort was the first ski resort to open in Korea. The resort’s accommodations are located nearest to the ski slopes, which makes it a popular venue amongst skiers. The resort has a diversity of slopes, including the longest slope in the nation, in addition to a 7.4-kilometer long round-trip gondola. With the resort’s high amount of annual snowfall, visitors can enjoy both an exciting ski trip and a beautiful winter getaway. 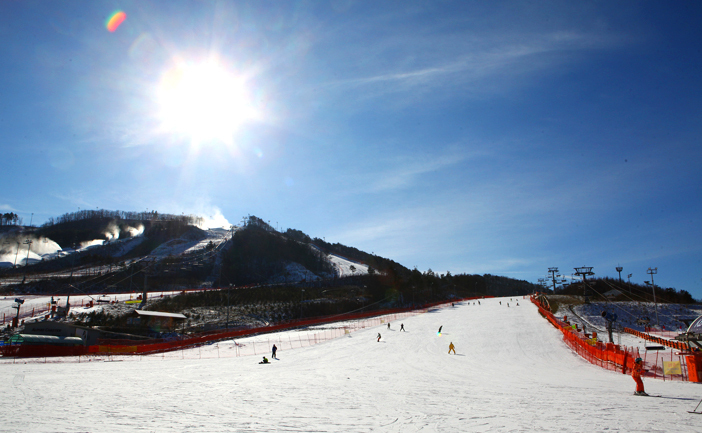 Yongpyong Ski Resort has hosted the alpine competitions for the PyeongChang 2018 Winter Olympic Games. ☞ Nearby attractions: Daegwallyeong Sheep Farm, Dutasan National Recreational Forest, etc. Vivaldi Park Ski World, located in Hongcheon, has become a favorite among young skiers in their teens and twenties; even the slope names like Hip-Hop, Techno, and Funky are geared towards young adults. Some of the more advanced slopes are uniquely designed with unexpected twists and turns for maximum thrills. For those who are new to winter sports, Vivaldi Park Ski World provides the perfect setting to safely enjoy skiing and snowboarding. There are a variety of slopes with different inclines and distances to give new snow sport enthusiasts the perfect chance to gradually work their way up from the bunny slopes to the more advanced courses. Overall, the park offers 12 different slopes and ten lifts. The resort also includes Vivaldi Park Ocean World where you can relax at the spa after a long day of hitting the slopes. ☞ Nearby attractions: Sutasa Temple, Hongcheongang River, Sambong National Recreational Forest, etc. Recognized for its size and safety by the International Ski Federation (FIS), Welli Hilli Park Snow Park is equipped with an international-sized board walk super pipe. Its FIS certification and variety of facilities have made it a popular destination for skiers and snowboarders alike. The resort offers 20 slopes ranging from bunny slopes to black diamond courses and a mogul course to maximize fun and thrills. 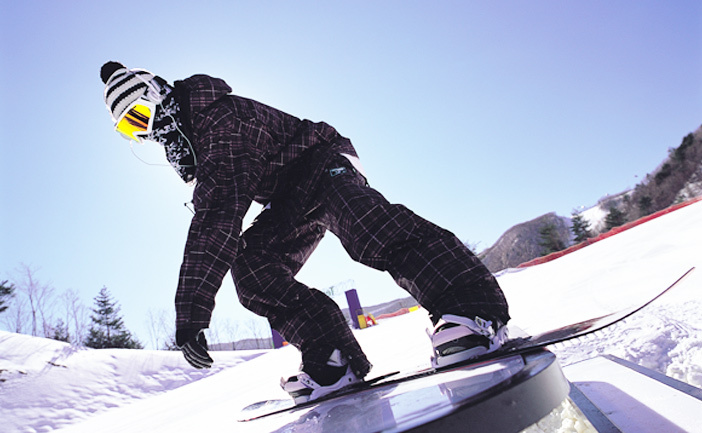 The Fun Park is the largest terrain park of its kind in Korea and offers facilities such as C-box, X-box, and wall box for snowboarders to practice their tricks. ☞ Nearby attractions: Cheongtaesan National Recreational Forest, Hoengseong Hot Springs Silk Road, etc. Alpensia Ski Resort is tucked away in the mountains at about 700 meters above sea level and is known for its excellent snow. 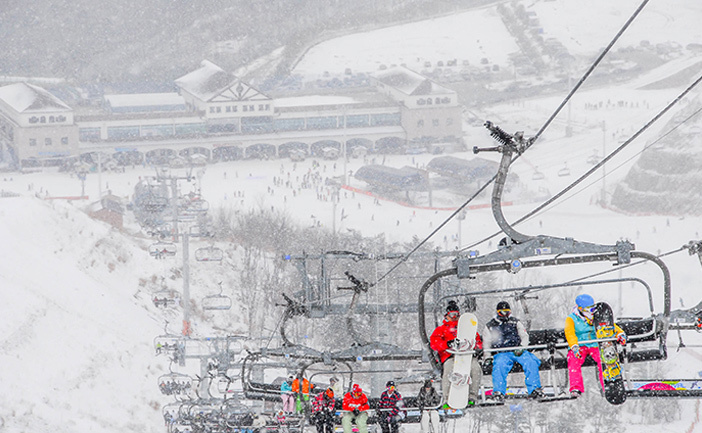 The resort offers six slopes with various courses for beginner, intermediate and advanced skiers and can accommodate up to 3,000 people at the same time. Snowboarding slopes and a long-distance sledding slope are specially designed for snowboarders and visitors with family respectively. As the main venue for the PyeongChang 2018 Winter Olympic Games, Alpensia Resort hosted many competition events, including but not limited to ski jumping, cross-country skiing, and bobsled. 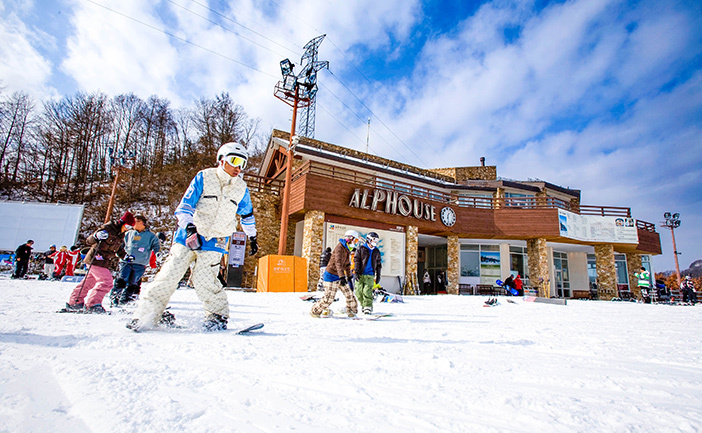 In addition to the exciting winter sports, visitors can enjoy many top-notch accommodation facilities within the Alpensia Resort complex, such as Holiday Inn and Suites Alpensia Pyeongchang, Intercontinental Alpensia Pyeongchang Resort, and Holiday Inn Resort Alpensia Pyeongchang, equipped with outstanding spa facilities. ☞ Nearby attractions: Odaesan Mountain National Park, Daegwallyeong Samyang Ranch, etc. 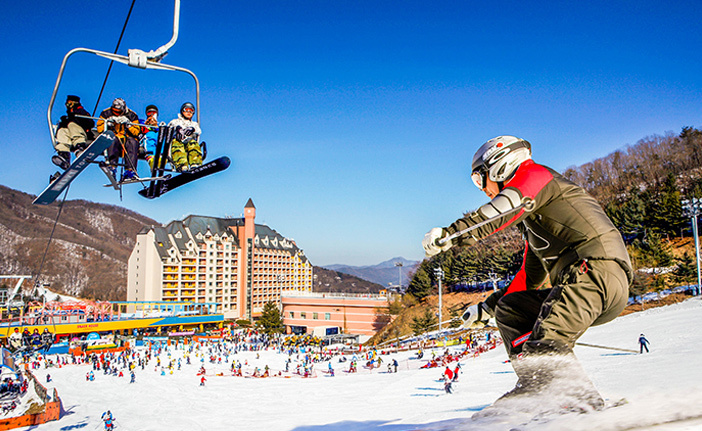 Elysian Gangchon Ski Resort is a deluxe leisure complex that is only one hour away from Seoul by subway and is situated near Baegyang-ri Station (Gyeongchun Line). The ski resort has ten slopes in an assortment of skill levels and six lifts. In particular, beginner and intermediate skiers can enjoy a variety of slopes since eight of the ten slopes are designed for beginners and intermediates. The slopes are designed to have a canyon-type formation, allowing skiers to glide down smoothly while enjoying the panoramic view of the beautiful scenery. For beginners who need a little extra help before heading out on their own, ski and snowboard lessons are also available through the ski school program. 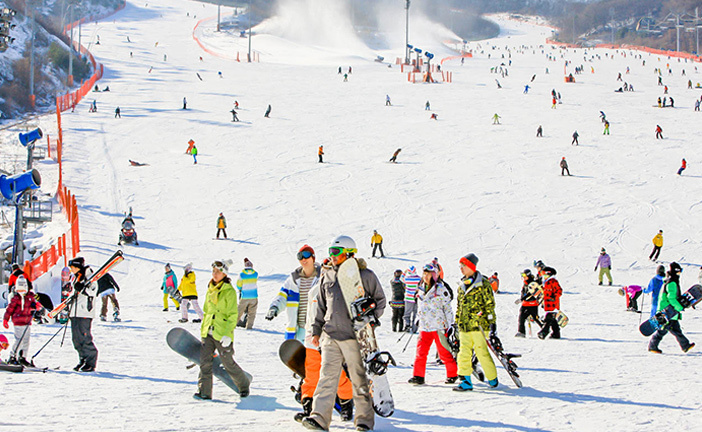 Located in one of the most pristine regions of Gangwon-do, High1 Ski Resort offers 18 fantastic slopes, each beginning at one of the park's three peaks. One of the peaks provides a 4.2 kilometer-long gently-sloping course for beginners. High1 Resort also has two slopes that have been used for Ski World Cup competitions. The resort is known for its convenient facilities for people with disabilities and special needs to enjoy skiing. High1 Resort offers state-of-the-art lifts including an automatic reading system for lift passes and a hands-free detection system. Nearby attractions include Kangwon Land Casino, trekking routes, a sledding site and a golf course, making it a family-friendly ski resort. ☞ Nearby attractions: Kangwon Land Casino, Hwaamdonggul Cave, Auraji Lake, etc. 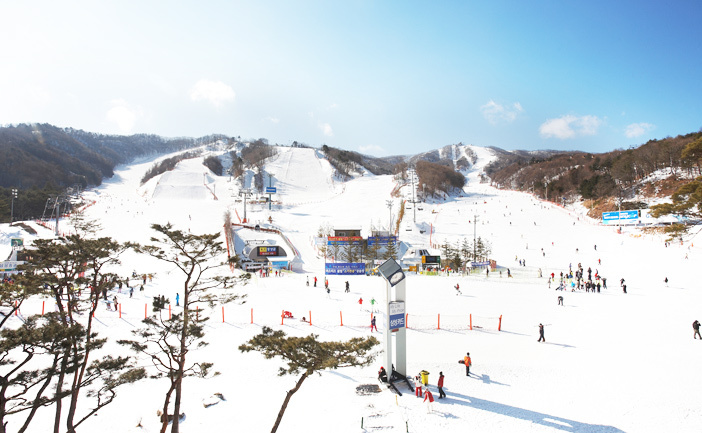 Named for a nearby oak tree forest, Oak Valley Snow Park is smaller than most ski parks in Korea. As a result, it offers a cozy, welcoming atmosphere with nine slopes, divided into two for beginners, five for intermediate, and two for advanced skiers. Oak Valley Snow Park is one of the best parks for snowboarders because there are no crowds and plenty of space to try new maneuvers! The resort operates a ski and snowboard school for beginners as well as a sledding hill. ☞ Nearby attractions: Chiaksan Mountain National Park, Baegunsan Mountain National Recreational Forest, etc. 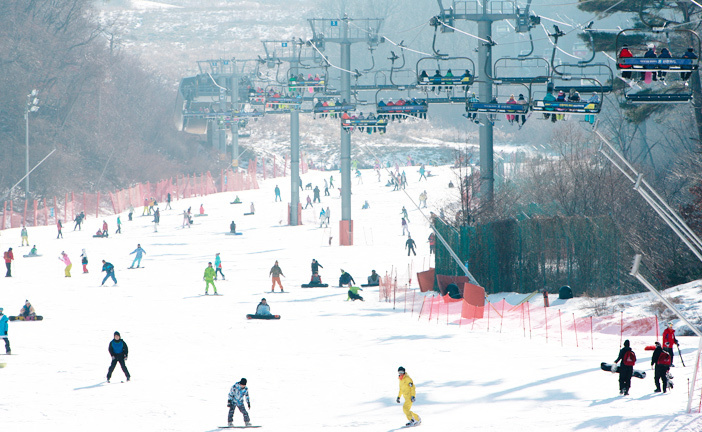 Bears Town Ski Resort is a great place for a one-day trip since it is located in Pocheon, just outside of Seoul. It was the first resort in Korea to adopt the equipment rental system for guests without personal gear to enjoy skiing or snowboarding. The resort offers a total of ten slopes with one slope exclusively for experts, two slopes for advanced skiers, three slopes for high intermediate skiers, two slopes for intermediate skiers, and two slopes for beginners. The resort is also a popular family destination, thanks to the 400 meter-long sledding hill and convenient lifts. ☞ Nearby attractions: Korea National Arboretum and Forest Museum, Sanjeonghosu Lake, The Garden of Morning Calm, etc. Located in Namyangju-si, Gyeonggi-do, Star Hill Resort is close to Seoul, making it possible for visitors to enjoy a full day of skiing without having to stay overnight. This small, cozy resort has six slopes and well-developed facilities in a convenient location that made it increasingly popular among visitors from Seoul and the nearby metropolitan area. ☞ Nearby attractions: Cheonmasan Mountain County Park, KOFIC Namyangju Studios, Chungnyeongsan Mountain Recreational Forest, etc. 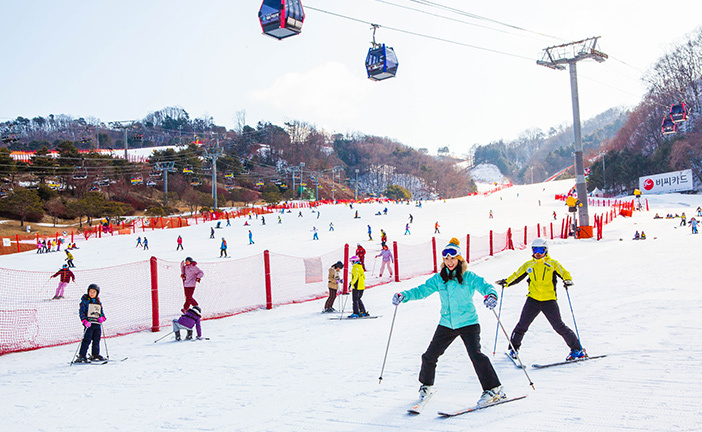 Located in Icheon-si, Gyeonggi-do, Jisan Forest Ski Resort is close to Gangnam in Seoul, meaning that even if accommodations are fully booked, visitors can make a daytrip out to this beautiful ski resort. There are seven main ski slopes and three sub-slopes, as well as five high-speed lifts, allowing quick access and less time waiting in line. In addition, there is an escalator for children and beginners. Even though this particular resort is on a smaller scale, it is packed with convenient facilities at inexpensive prices. The resort is a great value for its price, thus providing visitors an affordable winter sports experience with great quality. ☞ Nearby attractions: Icheon Cerapia, Termeden, etc. 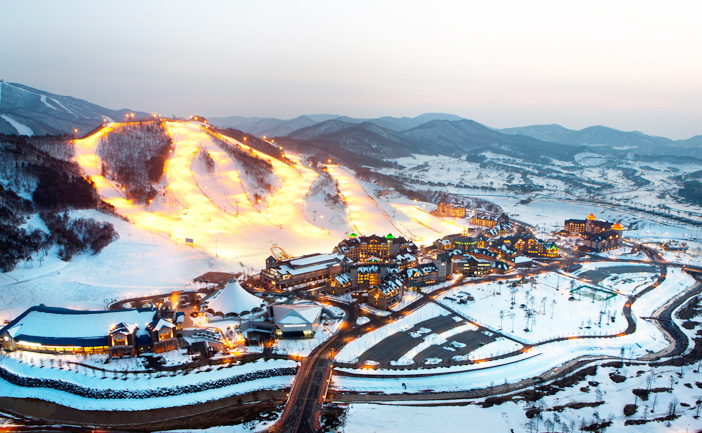 Located in Yongin, Gyeonggi-do, the Yangji Pine Resort Ski Valley has six ski lifts, and ten slopes for various skill levels. Night skiing is very popular at Yangji Pine Resort as the well-lit slopes give visitors opportunity to enjoy a nighttime skiing experience even past midnight. The park also offers a sledding hill for families and ski lessons for all ages, welcoming beginners who are new to the experience. 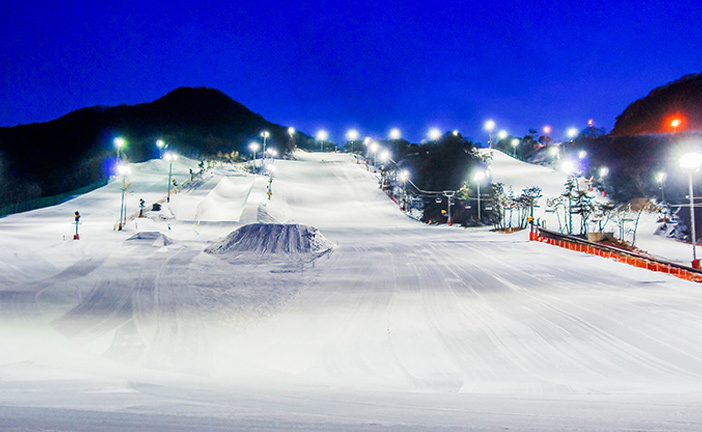 Located in Gwangju, Gyeonggi-do, Konjiam Resort is the largest ski resort in the Seoul vicinity, offering nine slopes with varying degrees of difficulty, as well as five ski lifts. The resort also limits its number of daily visitors to a maximum of 7,000 people per day in order to offer the best skiing experience with a wait time of 15 minutes or less. 70% of the slopes are reserved for beginner/intermediate skiers and senior citizens, perfect for families. Furthermore, the resort includes an arboretum, ecological river, spa and other auxiliary facilities. ☞ Nearby attractions: Namhansanseong Provincial Park, Gyeonggi Ceramic Museum, etc. 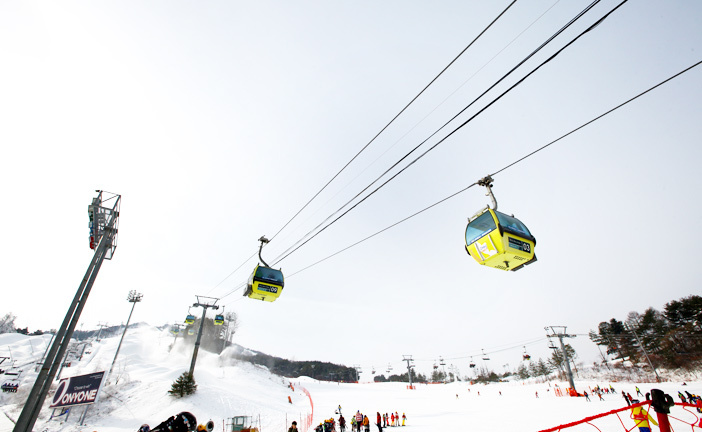 Located within Deogyusan Mountain National Park in Muju, Jeollabuk-do, Deogyusan Ski Resort has long been a popular ski destination for both Korean and international skiers. This gorgeous mountain ski resort not only has a large number of ski courses, but also breathtaking views that allow skiers to take in the beauty of the snow-covered slopes while they ski. 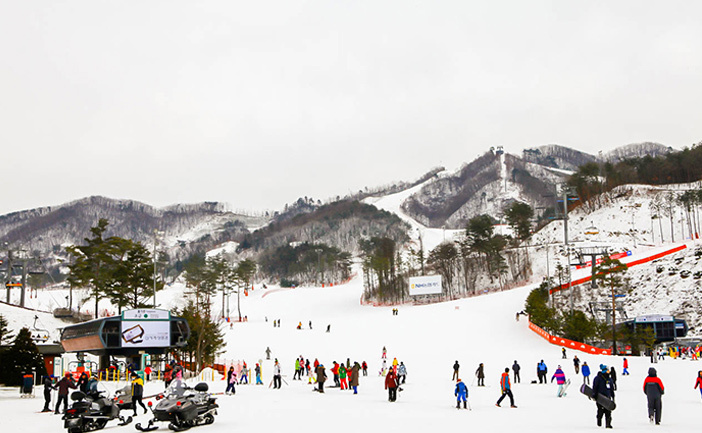 The resort's Silk Road Slope, which starts from the peak of Deogyusan Mountain at 1,520 meters above sea level, is the longest run in Korea, at 6.1 kilometers in length. The course was designed for both beginner and intermediate skiers to enjoy. For those who want a refreshing experience, try the outdoor hot springs after a day of skiing. * Availability of foreign language assistance may vary by work schedule of staff. ☞ Nearby attractions: Muju Meoru Wine Cave, Bandi Land, etc. As the only ski resort in the Gyeongsang region, Eden Valley Resort provides an environment fit for skiers of all levels. Of the seven slopes ranging in length from 454 meters to 1,495 kilometers, two are for beginners, three are for intermediate skiers and two are for advanced skiers. Each slope has a different starting point, but they all wind gently down along the mountainside to come together at the base. The three lifts are fast in their service so that there is hardly any waiting in line. ☞ Nearby attractions: Gajisan Mountain Provincial Park, Tongdosa Temple, Sinbulsanpokpo Falls National Recreational Forest, etc. ※ Ski season start and end date at all resorts are subject to change based on weather conditions. Please check in advance. * This column was last updated on October 2018, and therefore information may differ from what is presented here. We advise you to check details from the official websites before visiting.